I clearly remember many refugee stories--people who are some of my beloved friends. But I also thought of a visionary man, Elder Marion D. Hanks, a man who has a remarkable story of his work with refugees. In the early 1980’s, he observed perilous conditions in Southeast Asia where he was serving as an Area Authority in Hong Kong. He too yearned for the church to become involved in the refugee effort of that decade (specifically in Southeast Asia) and thus, a few of us were called, as missionaries, to teach and work in refugee camps. However, we were absolutely not allowed to proselyte or even mention the church in any way. I was a missionary, but was strictly forbidden to talk about the church. We developed an agency within the refugee camps that helped the refugees as they waited for their sponsored countries to accept them. Working with other agencies like Catholic Relief Services, the Red Cross, and government and UN officials, we learned how to build a program that was highly respected. We were young, mostly inexperienced, but no one told us we couldn’t do anything. And Elder Hanks gave us all the confidence and support to make it happen. Within the space of about ten years, thousands of refugees were taught temporal and practical skills in Thailand, Hong Kong, and two camps in the Philippines. As Marion D. Hanks, who instigated missionaries to work in refugee camps under the auspices of the UNHCR (United Nations High Commissioner for Refugees) taught us in the 1980’s: “Serve with no strings attached--without looking for any credit. Our purpose is to serve in a way that exemplifies pure religion. As you teach and visit with the refugees, you are sitting in proxy for the Savior.” Elder Hanks further instructed, “You are on a historical errand, and God is depending on you to give solace, comfort,and love to our brothers and sisters who have gone through a refiner’s fire.” None of us would ever be the same. How could we be? We taught them English, but also practical skills to hopefully assist and benefit them in their sponsored countries. We had fun together, and tried to help them forget their current circumstances--with staged fashion and community shows, fairs, and mock job and bank interviews. There was a lot of comic relief. We reviewed the lesson with our translator before we presented it to the class; there was a great trust we developed together. We tucked in jokes, songs, stories to entertain as we taught them about how to apply for a checking account or how to use a vacuum cleaner. Sometimes as I would teach, I unintentionally would say something that would open a flood of emotion, and then just like dominoes, several rows of faces would be dripping with tears. They would talk, and I would listen, and my tears would stream with them. I had not graduated from college yet, but attempted to handle caseloads of psychotherapy every day. I knew that listening to their stories meant more than anything I could say or teach them. One day we pretended to have 335 Vietnamese refugees on a plane, with me as their attentive stewardess (of course, none of them had ever been on a plane and it generated many roars of laughter as they all sat in their designated rows). We taught, with our translator, holding microphones, in large pavilions or sheds, with only a roof and a cement floor. Sometimes there would be 1000 students at one time, sitting on their mats, waiting for me to teach them with my translator. Women breast fed babies, and brought their children to listen too. Men, with anxious faces, tried to grasp a new language and imagine the country they were bringing their family to. I taught Buddhist monks who invited me to their self-made temples in the refugee camp. Older people, who had never held a pencil in their hands, were my students too. We visited their make-shift homes, which were large sheds with three sides--several families living together. Hammocks blowed breezily, as children played and ran in the dirt around them. I loved teaching the refugees in those big sheds, but the best visits were often times when we sat one-on-one, and they could bear their soul or just talk about their dreams. I visited hundreds of those homes, hearing of how they had experienced Pol Pot’s genocide or their experiences on the open seas. We communicated to them through translators that spoke Vietnamese, Cambodian, Lao, and Hmong. I could speak Mandarin Chinese to them, if they were ethnic Chinese. Every day my heart was ripped out, as I heard their tales of trauma and torture--of how they had seen their families slaughtered before their eyes or their women raped on the seas. 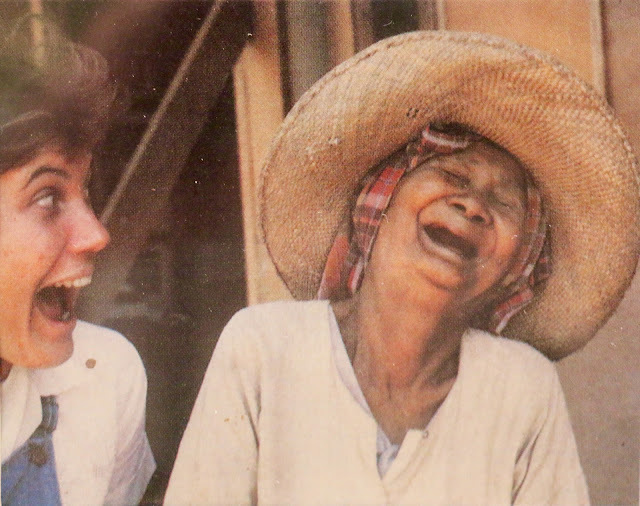 But we also laughed, long and hard, even forgetting momentarily where we all were: in a refugee camp. We sang, with glee and even happiness--they showing to me as a young 22 year old what it means to survive and go forward when life looks drearily bleak. I was their "teacher,"--a revered position in Asian culture. Although I was young, naive, and mostly ignorant of their struggles, they loved me anyways. However, if I were to be honest, their stories, lives, examples have fueled me all these years. Actually, they were my teachers--on how to forgive, garner courage, generously give (they frequently gave me their bananas from their food rations or invited us to dinner with their meager provisions), and to gloriously laugh. Often we unconsciously stopped time with our jokes. As I look back on those times, laughter was one of the most important things we gave each other. We needed it. Recently I returned to Southeast Asia, after being gone for three decades. But their stories and faces have never been too far from my heart. Some of them I tracked down later in the US, curious to see how they were faring in their sponsored country. A few months ago, while in Southeast Asia, I visited a prison and killing fields where Cambodians were tortured and killed before their family and friends. I swayed on the same open seas around Vietnam where my friends had experienced abuse and neglect of every kind as “boat people.” The trip made me confront images of my mind, their stories--the experiences of refugee faces that have never been too far away. As one Cambodian refugee said, "It would take a river of ink to tell our stories." I am grateful that for a short time, at least, I was able to be in the presence of some of the most wonderful people I have ever known--in refugee camps. After I recently saw their killing fields and the places they had fled, the memories of our laughs and tears streamed together. Many faces and stories unravelled--reminders of their tutoring me on how to be human when others have forgotten how. Whether they knew it or not, they helped me grow up. Because of them, I am comfortable with women who wear burqas or men in Buddhist robes. They taught me that no one is a stranger because I know both of our stories need to be intertwined. Elder Hanks’ vision to rescue the Southeast Asian refugees altered my life, and has given them a refuge in my heart and homes all these years. When I heard Elder Patrick Kearon speak a few days ago in General Conference, my old friend’s voice intermingled in the recent talk about refugees. Elder Kearon ended with a probing thought, “The moment of being a refugee does not define them, but our response to them will help to define us.” Elder Hanks was teaching the same principle 36 years ago in the April 1980 General Conference when he said, “There are others, nearer at hand, who struggle with problems with which we must also be concerned. . . . We must have “individual concern for the strangers among us, resident or passing through.. . .” In other words, refugees can be far away in remote places, but they can be in close proximity too. It is for us to discern how to help the strangers around us. This is beautiful, Maryan. Thank you. Happy birthday!! Makes me weep. Love you so! This is beautiful! Thank you for sharing these wonderful experiences. Although I have never met you I felt very close to you as I read your beautiful description of laughter and tears with "strangers" who became your friends. I just came back from the UN where my group Sustainable Families did a standing room only presentation on Strengthening the Refuge Family. We are going to do something similar again at the UN conference, Habitat III in Quito this fall. I would love to pick your brain!